Every time you hop behind the wheel of your car, you’re taking a calculated risk. While 99% of the time, everything is fine, and you make it to your destination with ease, there’s always the chance that something can go wrong whether it’s your fault or not. Some stretches of highway across America are more dangerous than others. Just a preface on how these roads made the list. The following areas experience higher accident ratios and fatalities than average roads annually. They are also located in areas where RVers and road trippers are likely to be traveling. We are not saying that you should never travel on these roads, just a heads up that these stretches of road have an unusually high number of accidents and fatalities and may need a steady and experienced hand behind the wheel. Alaska is home to gorgeous untouched land, and there’s a reason it’s known as the Last Frontier. Unfortunately, this means many of the roads may not always be properly maintained. There’s a reason even ice road truckers are scared driving through this part of Alaska, and there’s a whole show dedicated to their adventures. 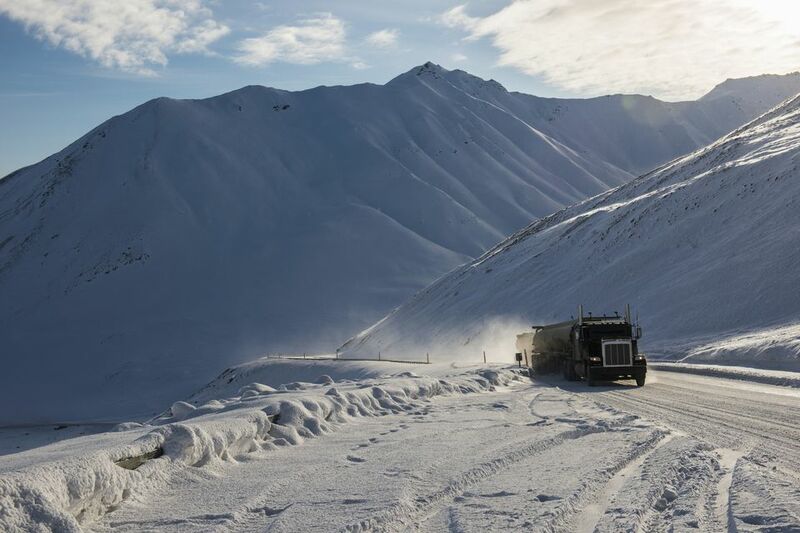 The Dalton Highway is a main Alaskan thoroughfare from Fairbanks to northern portions of the state. This 414-mile dirt stretch is winding, steep and remote. The road only averages one fatality a year, but there is no question that it is dangerous thanks to the wintry weather, whipping winds, and ice that doesn’t always met throughout the year. Several of our readers have likely found themselves on the stretch of Interstate 10 that connects Phoenix to the border of California. This one 150-mile stretch of road made up over 10 percent of all traffic fatalities in Arizona in 2012. It’s easy to fall into a lull looking at the same stretch of road before you for miles and miles. So, what’s causing all these crashes? Arizona Public Safety Officer Sgt. Dan Larimer contributes the many wrecks to the desert road’s long straight stretches that cause high speeds, aggressive driving, illegal passing, and inattentive drivers. Highway 550 is a high elevation roadway that takes you through portions of southwest Colorado and more specifically the San Juan Mountain range. The road can reach elevations of 11,000 feet and experience all sorts of weather. If you’ve never been above sea level before, you may even develop altitude sickness driving this route. The good news: Colorado has snow plows to move snow, ice, and debris off the road, and the Colorado Department of Transportation is good at closing stretches of Highway 550 when necessary. The bad news: For plows to operate efficiently, the road does not contain any guardrails. If you find yourself on Highway 550, watch the road carefully, don’t hug the lines, and drive cautiously in severe weather to avoid going over a cliff. Several snowbirds may find themselves along this tropical interstate along the Atlantic coast of Florida. The views may be nice, but this 382-mile stretch of road had fatal accidents per mile (1.73) than any other road in the US during the five-year period between 2004 and 2008. Many accidents are caused by distracted drivers coupled with the road’s high volume. Always be alert of other drivers on I-95. Defensive driving, slowing down when necessary, and being aware of your surroundings is key to staying safe on I-95 no matter how far you must go to reach your destination. You can find Highway 2 in the more northern and remote regions of Montana. Drivers may easily find themselves on this remote highway due to its proximity to Glacier National Park, specifically if you’re driving from East to West Glacier. This wide-open stretch sees cars and semis blowing through at high rates of speed. That makes Highway 2 a dangerous road, but the real danger comes from the highway’s remoteness. It can take quite a while for any first responders to get to certain portions of the highway and even longer to get you transported back to a hospital or medical facility. These roads are a little more dangerous than others no question, but if you stay alert, watch your speed and pay attention to other drivers there’s no reason to stay away from them. Here’s to safe travels.